We’ve been in our new country for two weeks now, and it feels like all of our new experiences are already beginning to blend into an indistinguishable blur of exciting, busy days. Thursday was such a full day that it felt like a week, so I will just try to record most of it in this post for now. I am studying jewellery making at the Metallo Nobile school in Florence and learning through Italian. It is is a bit of a challenge, but easier than I anticipated and really enjoyable. They say that the most effective way to learn a language is to learn something through the language, and I can honestly say from my experience it’s true. I feel like my language comprehension skills have been elevated to a different level in a short space of time – but that’s the subject of a whole other blog post to which I will return at a later date! Thursday started with an early morning commute to Florence. 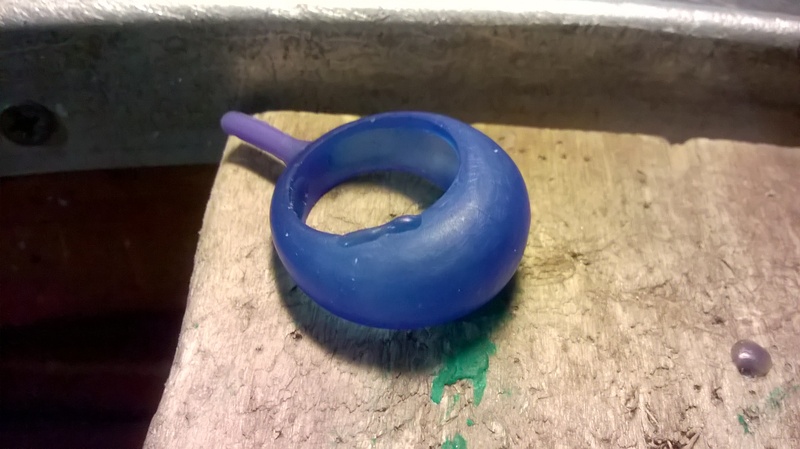 I usually don’t have to be there that early in the day, but I had to drop a wax model of a ring I had carved into GM, a foundry on Via San Niccolò, and they have limited opening hours for drop off and collection – Mondays and Thursdays only, from 11 am to 3 pm. 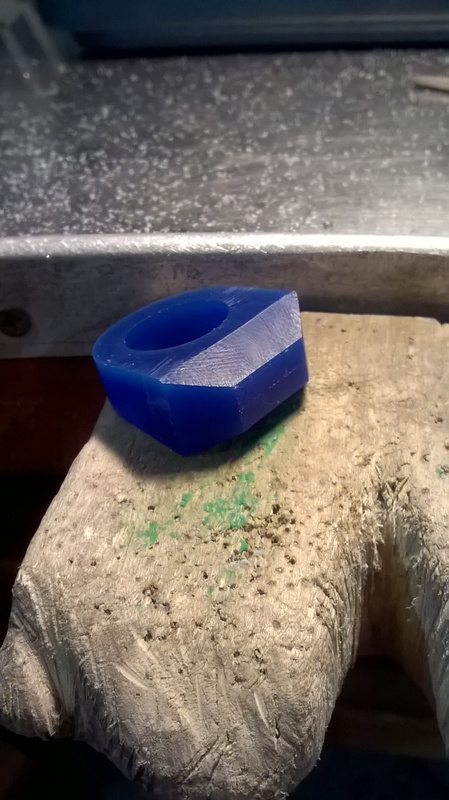 Bombato ring model, wax has been carved down to 1 mm in thickness so it is slightly transparent. Blobs of wax are repairs. I also had to buy some supplies for my class later in the day – some silicone for mould-making and some gemstones. 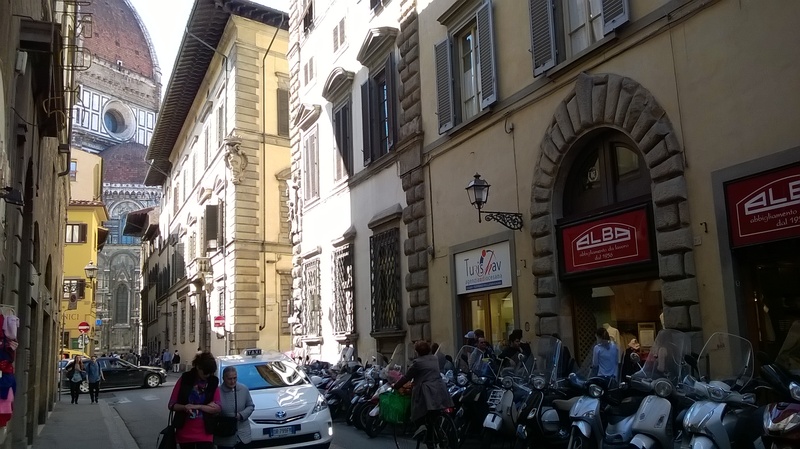 But first stop was La Feltrinelli bookshop at Firenze S.M.N. train station. They have free wi-fi and a reading area, which gave my morning-addled brain the opportunity to find out where exactly I needed to go and to mark on my map the order in which I needed to do everything in an effort to save my feet. Mealli, a jewellery materials supplier on Borgo S.S. Apostoli was my first destination to get some silicone blu spagnolo, recommended by my tutor Ignacio. He’s an incredibly helpful teacher, and even though my Italian is patchy and his English is about the same, I can understand him for the most part, and he me. As coincidence would have it, upon my arrival at Mealli, who should I find ahead of me at the cash desk but Ignacio and another equally amiable tutor Agasi, buying supplies for Metallo Nobile. Ciaos and buongiornos were shared, and suddenly I felt very much like Florence wasn’t such a strange city anymore, but a place where I can run into people I know and have an impromptu conversation about the benefits of using green, rather than blue wax, for carving very delicate items of jewellery. I bought my silicone blu spagnolo and shouted ‘A presto!’ to my teachers as I left, aiming next for Via dei Servi in search of gemstones. 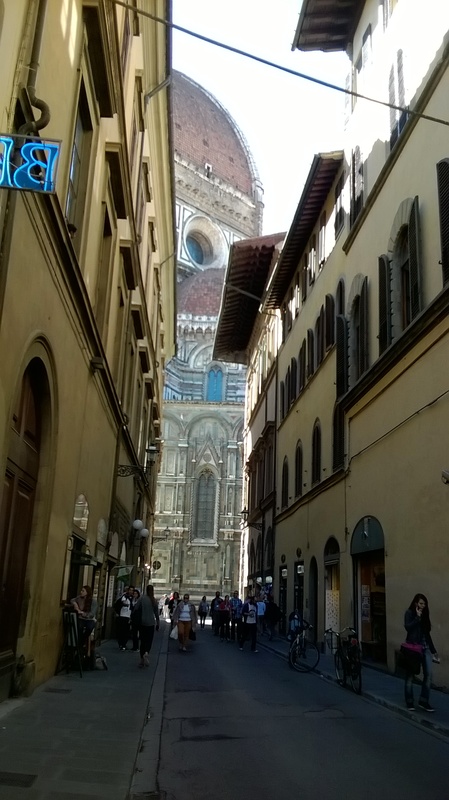 After a few distractions along the way, on I went, weaving my way around the packs of tourists and selfie-stick sellers at the gargantuan Duomo, and onto Via dei Servi where the Mineral Shop Firenze is located. I selected some quartz and haematite from the helpful staff there and began my return journey towards the Duomo. 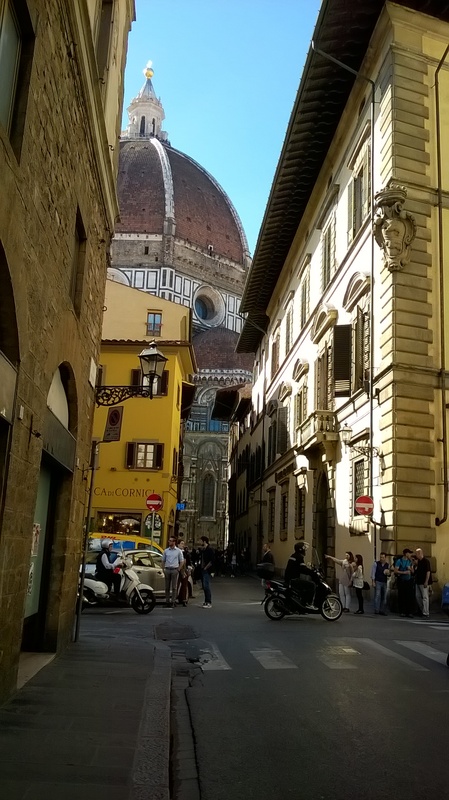 Which is when I was struck by the view of the Duomo, framed by the buildings at the end of the street. This happens a lot here – a sliver of an imposing building of historical importance will appear, jostling for position among its younger neighbours and the effect is striking. The Duomo resembled a massive, octopus-like, monster – the circular window under the domed roof was an eye, and the tall window at the lower lever could have been a growling mouth sucking the air for the taste of unsuspecting tourists through it’s leaded teeth. I checked the time and realised I had to pick up the pace if I wanted to get to the foundry and have some food before my class started in the afternoon. The day had suddenly grown hot, and people were already seated under the shade of trattoria parasols enjoying il pranzo (lunch). I was getting tired and hungry and uncomfortable in the heat. Crossing the Arno and admiring the Ponte Vecchio from the less glamorous Ponte Alle Grazie, I walked to GM foundry on Via di San Niccolò and my ability to speak any Italian just seemed to evaporate from a combination of heat and hunger. I did the lazy thing and blurted out ‘Mi dispiace. Non parlo italiano. Parla inglese?’ and immediately felt dishonest. 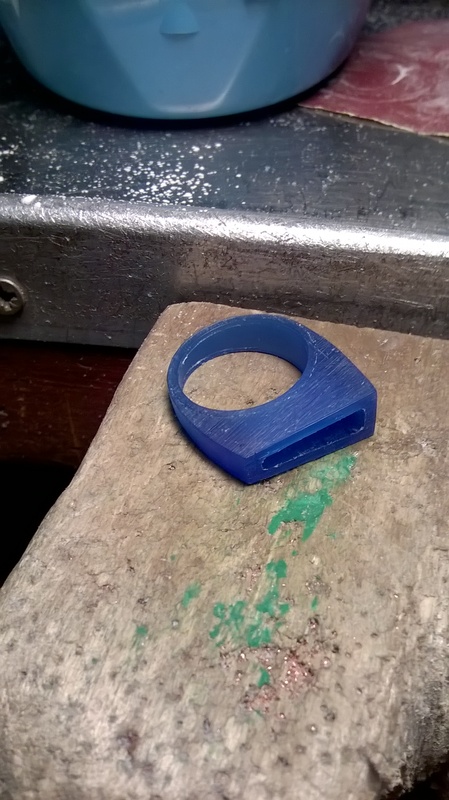 I had previously known exactly what I needed to say to the owner, and I knew the correct terminology to use to ask for the wax model to be cast in silver. I knew how to ask him when I could come to collect it and how much it would cost, but my brain decided to get revenge on me for the extra early start that morning. I blurted out ‘colare’ (to cast)…’questo’ (this)…. ‘uhhhh'(same as in English)….’mi dispiace’ (I’m sorry) and felt like a bit of an idiot. A very smiley woman who had been served just before me, spoke to me in English, asked what I needed done and translated for the owner. I grazie mille‘d her and the owner and scampered out the door, envious of the parasol appreciation club across the street stuffing their faces. Suddenly the smiley woman was beside me, with her scooter helmet already firmly in place on her head, extending an invitation to me to come visit her studio on Via di Fossi. Now, four years living in London has resulted in my absorption of a particular trait that natives of the UK capital think is normal when confronted with friendly strangers – immediate suspicion that they are a serial killer. If I had gone straight from Ireland to Italy I would not have suspected any homicidal intentions whatsoever. Italians seem to be open to such encounters as much as people in Ireland, but London had obviously taken its toll on me! She asked where I was studying and if I had a pen and paper. She scribbled directions and contact details on the end of my to-do list, instructing me to call her first to arrange a time because she is always out and about in the city. I nodded, failed to even speak English this time, and off she darted onto her scooter and away. At this point I was famished, and knew I was running out of time to fit in some lunch before class. The walk from the foundry towards the jewellery making school on Via Toscanella became a trot along Via dei Bardi, but once again I was forced to stop by the beauty of my surroundings. 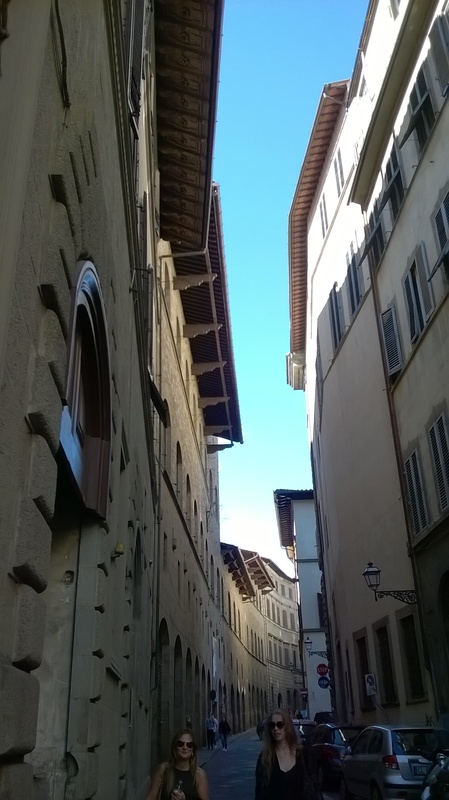 The buildings gently curved around into the distance and the wooden roofs overhanging the street jutted out against the sky, creating a blue strip of negative space worthy of a pause, despite being hungry and pressed for time. 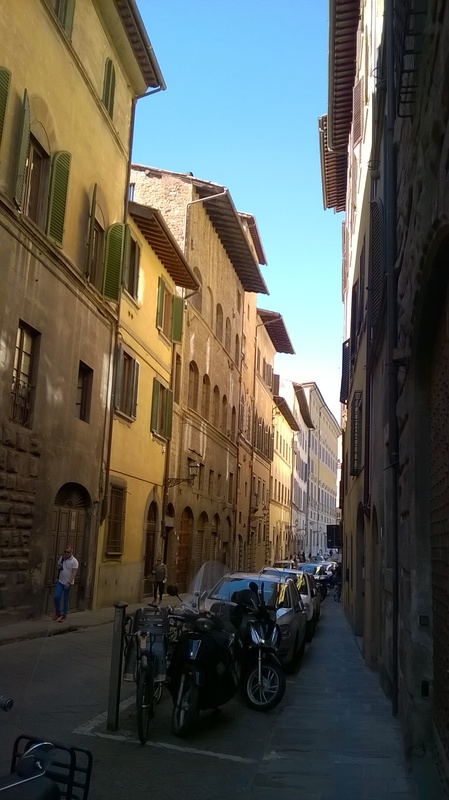 Even the negative space in Firenze is aesthetically pleasing! I raced to grab a delicious €5 takeaway pizza from Gustapizza around the corner from the Metallo Nobile school and sat on the steps of the Basilica di Santo Spirito to enjoy it, surrounded by students, tourists and visitors all doing the same. I could have done with a traditional afternoon nap at this point, but I had yet to start my studies for the day so an espresso in the jewellery studio would have to do instead. Hopefully it would also help my Italian speaking abilities to kick in or I could struggle for the next few hours. Ignacio and Agasi both greeted me and I set to work, filing my geometric wax model of the next ring I was making. The pizza and coffee seemed to convince my brain that I could safely abandon English for the afternoon and communication was pretty straightforward. Ignacio checked the quality of my work and declared ‘Molto bene, basta…’ and gestured that I should stop now. 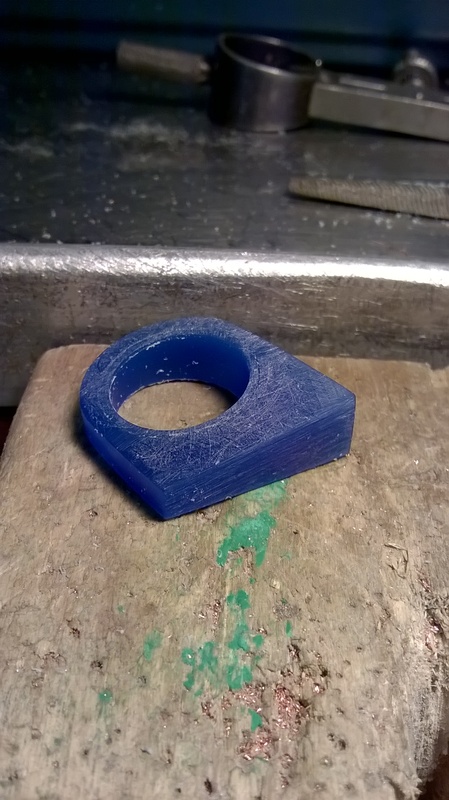 I finished the model and he instructed me to bring it to be cast at the foundry on Monday morning when I go to collect the bombato ring from the wax model I dropped off earlier in the day. We had enough time at the end of class to look at the gemstones I’d brought in, and dip them in hot wax to make little cups which will be cast in silver to hold the pietre perfectly. He instructed me to spend the weekend thinking about ways I might like to combine the stones to make another piece of jewellery, do some sketches and come to class on Monday with as many ideas as I can. He will tell me whether they are possible and we will go from there. 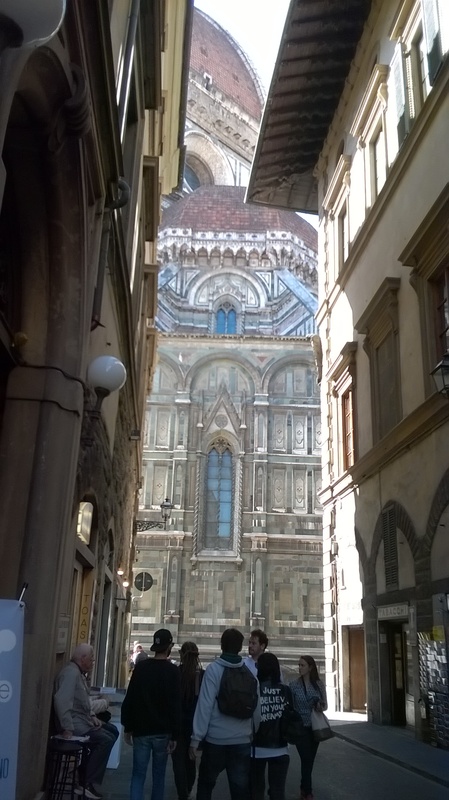 I leave at around 6 pm and am drawn again to the Duomo end of town. Grom, the gelateria near there, is doing a roaring trade as usual and I decide to treat myself to a salted caramel, chocolate and pistachio cone. I order entirely through Italian to make up for the earlier language laziness at the foundry and sit admiring the giant octopus-monster again which now looks a lot more like a cathedral. The tourists are still milling around in excited droves, pursued by the selfie-stick sellers, all equally eager to squeeze the last opportunities out of the day. I notice that my icecream is colour co-ordinated with the stone used in the facade of the cathedral and I spend about 45 minutes sitting there enjoying the atmosphere and the daylight fading. The train back to Bologna leaves at 8.38 pm, so I make an early start in the direction of Firenze S.M.N. to allow myself time for inevitable distractions. I decide to make a slight detour to the Piazza della Repubblica and there I find diversion for another 15 minutes. 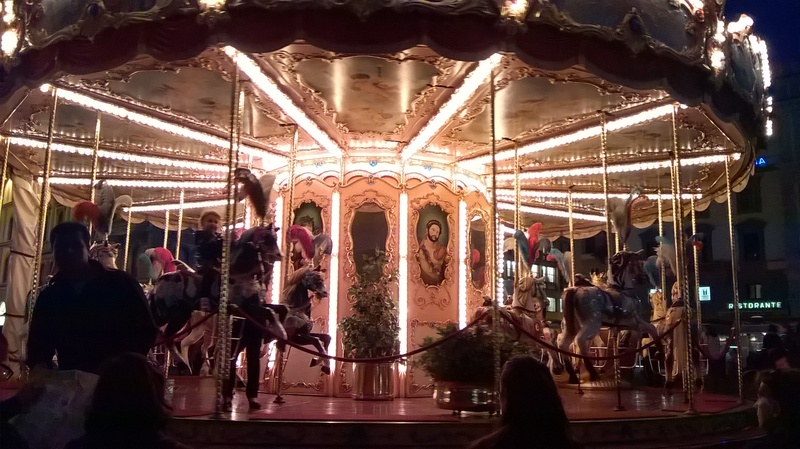 There is music drifting across the square from an illuminated carousel, where children and selfie-stick owners are enjoying the ride. It’s a really impressive carousel, with real feather plumes in bright colours on the horses heads, mirrors glittering on every surface, potted plants dotted around and putti smiling down from the ceiling. Even fairground rides are beautiful here. I feel like I’m in a film, and half expect somebody to get shot by a gun disguised as a selfie-stick. I leave and head to the train station. Sono molto stanca ma felice.